About every six months or so, you need to change your car’s oil. Once a year, you get in with your doctor. After a decade or so, it’s best to look into roof replacements. There are lots of checkups that need to happen in our lives, because they catch problems before they turn into something bigger. The same is true for your HVAC. Whether for your home or business, it’s necessary to get your heating and cooling in with the right specialists each year to ensure everything is running smoothly. When it comes to heating, the last thing you want is to wake up shivering on a cold January morning, with the realization that your furnace is not doing its job. You’d hate to go away for holidays and come back to pipes that have burst, all of which could have been prevented if you knew your thermostat wasn’t working. With IceBound HVAC & Refrigeration, we can ensure that your HVAC is up to snuff every year, for every season. Find information on heating checks, and give us a call to make sure your home or business will stay comfy during the colder months ahead. Heating checks are performed routinely by our HVAC team. We examine the state of your heating unit, thermostat, and air filters, to name a few examples, ensuring that everything looks to function normally. If we spot something problematic, we’ll let you know right away, and recommend whether repairs or replacements are in order. IceBound works with businesses and homes in the Pooler area. While homeowners tend to keep their HVAC checkups consistent, the same isn’t always true for business owners. Businesses oftentimes have so many other things going on that they don’t think to get their heating system checked — we couldn’t be more adamant that an annual checkup is essential for you. The last thing you want is to run into a serious problem, then need to wait days or weeks to get a new heating unit in place. You could lose a ton of business, and also be missing out on revenue-reliant days. Missing out on profit for days at a time + the expenses of a full-blown replacement? You’re much better off scheduling a commercial HVAC inspection with IceBound. 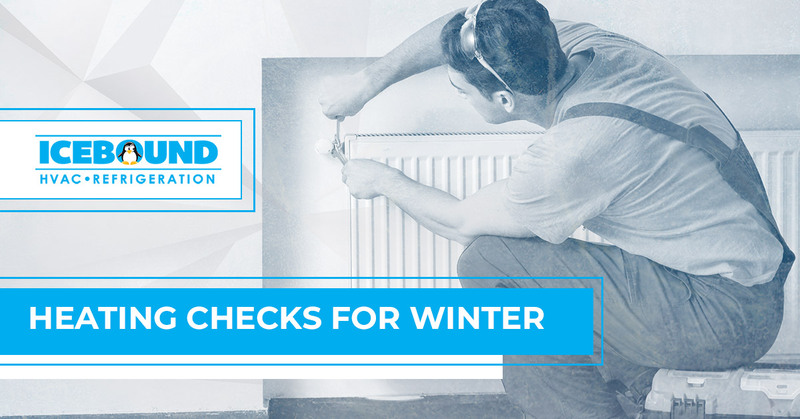 Heating checks should be performed well before the time that your heating unit will be in use. Early fall is your best bet to schedule a heating check — but even in later fall, it’s better to get it done than not at all. Imagine a bike with a little bit of rust on it. If you treat the rust right away, you’ll likely stop the damage in its tracks. If you put it off, you’ll encounter much more extensive rust problems, and it will cost more to fix. HVAC is the same in that little checks and preventative measures are significantly less expensive than dealing with larger issues. While you’ll have to replace your heating unit at some point in time, it’s so much better to have that planned out, than to unexpectedly need to drop thousands of dollars to keep your business, home, and family safe. Why, IceBound HVAC & Refrigeration, of course! We’re Pooler’s No. 1 choice for HVAC services, and have been for more than a decade. But you don’t have to take our word for it, because we know how costly HVAC services can be — you want to make a good investment and not waste your money and a company with little integrity or experience. Take a look at our reviews, and schedule your heating check with IceBound today! Just fill in your basic info below and we'll get in touch with you.